When you go looking for the right hydraulic hose assemblies to use with your hydraulic equipment, you need to pay attention to all of the parts and components that are included to ensure that you don’t get the wrong parts. When you look at just the hose, there are three primary components that must be taken into consideration. Each of these plays an essential role in allowing the hose to work properly in the intended environment. Many variables can affect the ability of Fall River hydraulic hose assemblies to work effectively and efficiently. It is important to work with a Greater Fall River industrial supply shop that can readily get you hoses while you wait so you can replace worn or failed hoses right away. Metro Industrial & Marine Supply is a well-known supplier of custom hydraulic hose assemblies at our industrial and hydraulic hose shop near Fall River, MA. The first thing that you want to learn about is the type of hose that is used in your Greater Fall River hydraulic hose assemblies. The tube is located at the far center of the hose and is the material that is used to convey the hydraulic fluid or media from one end of the hose to the other. It must be able to withstand the fluid’s properties to protect the outside of the tube from leaks, breaks, or stress. The second layer is the reinforcement layer, which is often made of metal or a variety of other strong materials. It can be spiral, helical, braided or just about any other type of configuration to add strength and stability to your completed hydraulic hose assembly. The final layer is the cover. This is the outside part of the hose that you see. It is designed to protect both the inner tube and the middle reinforcement layers from the surrounding environment. Depending on the type of equipment that you use, you will require different types of hose components that you need from our Greater Fall River industrial supply. Protection from extreme heat, extreme cold, abrasive conditions, high-pressure or low-pressure situations, these are all things that must be considered. We can create custom hoses while you wait at our hydraulic hose shop near Fall River, based on the different specifications and requirements of each hydraulic machine, as well as where and how it will be ultimately used. The next part that you will need to consider are the fittings. Fittings are typically made of metal, which can also vary depending on your needs. Stainless steel, brass, aluminum and carbon steel are just some of the options used at our Greater Fall River industrial supply. Within the fitting category, you will notice a socket, which is the part of the assembly that goes over the outer cover of the hydraulic hose. You will also see the stem, which is the part of the fitting that goes into the inner diameter of the inner tube of the hose. 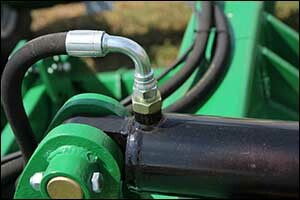 The connecting end of the fitting is what allows the hose to connect to the other components of the machinery. Much in the way that different types of hose material are used for specific types of hydraulic systems, fluids, and environments, fittings are also designed to meet certain criteria. Many of the specifications related to the fittings for your Fall River hydraulic hose assemblies are used specifically to fit a particular type of hose. In most cases, the hoses and fittings are a matched set that is recommended by the manufacturers for proper use. In addition to choosing the right fitting for the hose, it is also essential for the hoses and fittings to be assembled using the proper equipment and using the correct procedures. There are many specifications that must be adhered to for the proper application. When it comes to choosing the correct materials for custom hydraulic hoses when you visit our Greater Fall River industrial supply store, meeting the specific requirements for the equipment is extremely important. Operators need to check their hydraulic hose assemblies on a regular basis to make sure that there isn’t any visible wear and tear that might indicate potential failure. That being said, if the hose, fittings, and assembly are not selected and put together properly, a system failure or blow-out could occur that would result in a dangerous situation for operators, other employees and visitors to the job site. Everything from the correct pressure to the fluid that is being used for conveyance needs to be considered when creating custom hoses while you wait. Interested in the services we provide at our hydraulic hose shop near Fall River? Give us a call at 508-996-8400 to speak with one of our technicians about your needs or stop by our Greater Fall River industrial supply store. We are the premier choice for all of your industrial and marine supply needs at Metro Industrial & Marine Supply.